P-Trap 2" - Continuous Waste 2"
J-35 Type 304 stainless steel crumb cup strainer with removable stainless steel basket with locking shell. Basket fitted with rubber stopper on bottom. 1-1/2" O.D. chrome plated tailpiece, 4" long. J-35-STP Similar to J-35 drain above, except includes 1-1/2" O.D. type 304 stainless steel tailpiece, 4" long. J-35-GS Similar to J-35 drain above, except type 304 stainless steel ground seat stopper on bottom in place of rubber stopper. J-35-GS-STP Similar to J-35-GS drain above, except includes 1-1/2" O.D. type 304 stainless steel tailpiece, 4" long. J-35-FS Chrome plated brass drain with flat strainer and 1-1/2" O.D. chrome plated brass tailpiece, 4" long. J-35-SSF Type 304 stainless steel drain body, stainless steel flat strainer and 1-1/2" O.D. stainless steel tailpiece, 4" long. J-35-SSF-316 Type 316 stainless steel drain body, flat strainer and 1-1/2" O.D. type 316 stainless steel tailpiece, 4" long. J-35-SS Type 304 stainless steel drain with rubber stopper and 1-1/2" O.D. stainless steel tailpiece, 4" long. J-35-SS-316 Type 316 Stainless steel drain with rubber stopper and 1-1/2" O.D. type 316 stainless steel tailpiece, 4" long. JBRC-94 Type 304 stainless steel remote control drain with removable stainless steel cup strainer. 1-1/2" O.D. chrome plated brass tailpiece, 4" long. JB-99 Type 304 stainless steel drain from our Ballerina group. Features removable heavy gauge basket strainer and 1-1/2" O.D. chrome plated brass tailpiece, 4" long. J-35-316 Type 316 stainless steel crumb cup strainer with removable stainless steel basket. Basket fitted with rubber stopper on bottom. 1-1/2" O.D. type 316 stainless steel tailpiece, 4" long. J-35-GS-316 Type 316 stainless steel cup strainer with removable stainless steel basket. Basket fitted with type 316 stainless steel stopper on bottom. 1-1/2" O.D. type 316 stainless steel tailpiece, 4" long. J-35-SSW Type 304 stainless steel drain with 7" high stainless steel standpipe and 1-1/2" O.D. stainless steel tailpiece, 4" long. Includes rubber stopper. Alternate sized standpipes are available. J-35-SSW-316 Type 316 stainless steel drain with 7" high type 316 stainless steel standpipe and 1-1/2" O.D. type 316 stainless steel tailpiece, 4" long. Includes rubber stopper. Alternate sized standpipes are available. JV-35 Stainless steel drain with removable stainless steel cup strainer. Strainer fitted with rubber stopper on bottom. Less tailpiece. JV-35-T Stainless steel drain with removable stainless steel cup strainer. Strainer fitted with rubber stopper on bottom. 1-1/2" O.D. chrome plated tailpiece, 4" long. J-15 Chrome plated brass drain with rubber stopper. 1-1/2" O.D. chrome plated tailpiece, 4" long. J-15-SS Type 304 stainless steel drain with rubber stopper. 1-1/2" O.D. stainless steel tailpiece, 4" long. 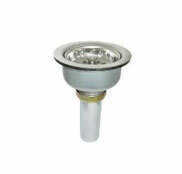 J-15-SS-316 Type 316 stainless steel drain with rubber stopper. 1-1/2" O.D. Type 316 stainless steel tailpiece, 4" long. J-15-CC Stainless steel crumb cup strainer with removable basket and 1-1/2" O.D. chrome plated tailpiece, 4" long. 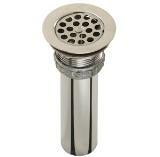 J-15-FS Chrome plated brass drain with flat grid strainer. 1-1/2" O.D. chrome plated tailpiece, 4" long. J-15-SSF Type 304 stainless steel drain with flat grid strainer. 1-1/2" O.D. stainless steel tailpiece, 4" long. J-15-SSF-316 Type 316 stainless steel drain with flat grid strainer. 1-1/2" O.D. Type 316 stainless steel tailpiece, 4" long. J-15-SSW Type 304 stainless steel drain with 7" high stainless steel standpipe, and rubber stopper. 1-1/2" O.D. stainless steel tailpiece, 4" long. Alternate size standpipes available. J-15-SSW-316 Type 316 stainless steel drain with 7" high type 316 stainless steel standpipe, and rubber stopper. 1-1/2" O.D. Type 316 stainless steel tailpiece, 4" long. Alternate size standpipes available. Chrome plated cast brass flat grid drain with 1-1/4" chrome plated 17 ga. tailpiece. For use with lavatory sinks with overflow. If overflow is not used, drain requires JSW-395 spacer and washer. Chrome plated overflow for use with J-115-FS drain. Specify bowl size being used. (Not Pictured)Spacer cup and washer when not using JHL-10 with J-115-FS. Overflow assembly for use with standard J-15 and J-35 series drains. Overflow face diameter 2-5/8". Head nickel plated brass with stainless steel face plate. 1-1/4" nickel plated brass elbow 14"x18". Nickel plated brass "T". Slip fit joint top and bottom for 1-1/2" O.D. tubing. Includes nuts, gaskets, sealing washers. 2" dia. hole required for head. Drain and tailpiece not included. J-35-BLA-1-1/2 Twist handle drain with chrome plated cast bronze body, stainless steel flat strainer, and 1-1/2" O.D. chrome plated brass tailpiece, 4" long. J-35-BLA-2 Twist handle drain chrome plated cast with bronze body, stainless steel flat strainer, and 2" O.D. chrome plated brass tailpiece, 4" long. 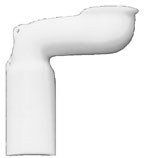 J-35-LAC-1-1/2 Twist handle drain with bronze body, removable stainless steel basket, 1-1/2" O.D. chrome plated brass tailpiece, 4" long. J-35-LAC-2 Twist handle drain with bronze body, removable stainless steel basket, 2" O.D. chrome plated brass tailpiece, 4" long. J-35-BLA-316-1-1/2 Lever handle drain with cast Type 316 stainless steel body, Type 316 stainless steel flat strainer, and 1-1/2" O.D. stainless steel tailpiece, 4" long. J-35-BLA-316-2 Lever handle drain with cast Type 316 stainless steel body, Type 316 stainless steel flat strainer, and 2" O.D. Type 316 stainless steel tailpiece, 4" long. J-35-BLA-CWO-1-1/2 Twist handle drain with chrome plated cast bronze body, stainless steel flat strainer, and chrome plated brass overflow tube. 1-1/2" O.D. chrome plated brass tailpiece, 4" long. Stainless steel overflow face. J-35-BLA-CWO-2 Twist handle drain with chrome plated cast bronze body, stainless steel flat strainer, and chrome plated brass overflow tube. 2" O.D. chrome plated brass tailpiece, 4" long. Stainless steel overflow face. 2" O.D. semi-cast, chrome plated brass P-trap with 17ga. wall bend. 2" continuous waste for double compartment food service or large capacity sinks. Chrome plated cast brass tees and slip nuts. 2" O.D. 17 gauge polished chrome tubing and tailpiece. Threaded cast brass end run clean out plugs. End outlet. 2" continuous waste for triple compartment food service or large capacity sinks. cast brass tees and slip nuts. 2" O.D. 17 gauge polished chrome tubing and tailpiece. Threaded cast brass end run clean out plugs. End outlet. Continuous waste for double compartment sinks. 1-1/2" O.D. chrome plated brass with slip fit connections at center outlet. Dimension from centerline-to-centerline of drain openings must be specified. Continuous waste for triple compartment sinks. 1-1/2" O.D. chrome plated brass with slip fit connections at center outlet. Continuous waste for triple compartment sinks. 1-1/2"O.D. chrome plated brass with slip fit connections at center outlet. Commonly used where different depth compartments are required. Continuous waste for double compartment sinks. 1-1/2" O.D. chrome plated brass with slip fit connections at end outlet. Continuous waste for triple compartment sinks. 1-1/2"O.D. chrome plated brass with slip fit connections at end outlet. Polished, chrome plated flat grid lavatory drain. Includes one piece 1-1/4" O.D. 17 gauge offset tailpiece. If overflow is not used, drain requires JSW-395 spacer and washer. Stainless steel cup strainer with removable stainless steel basket. 1-1/2" O.D. 17 gauge chrome plated brass offset tailpiece system. 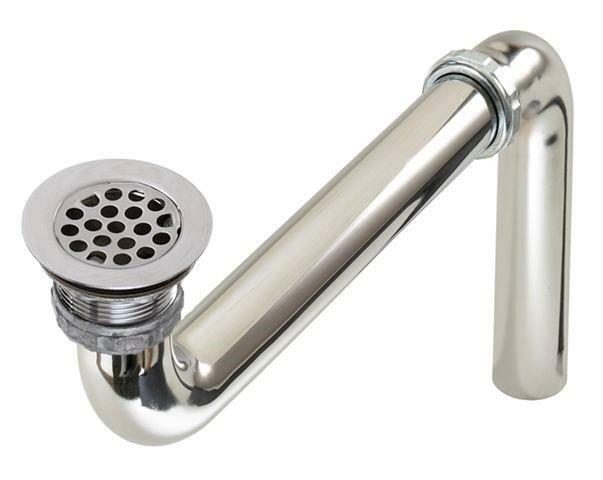 Chrome plated brass drain with flat strainer and 1-1/2" O.D. 17 gauge chrome plated brass offset tailpiece system. Chrome plated brass drain with flat grid strainer. 1-1/2" O.D. 17 gauge chrome plated brass offset tailpiece system. ADA Compliant, flame-retardant insulator, meets the 105◦F thermal conductivity level and chemical resistance requirements of ADA. Easy snap together installation. Kit fully covers drain. Use with 1-1/4" O.D. drain systems (J-ADA-115-FS). ADA Compliant, flame-retardant insulator, meets the 105◦F thermal conductivity level and chemical resistance requirements of ADA. Easy pull tie installation. Kit fully covers drain. Use with 1-1/2" O.D. drain systems (#35 type).